Sparkling Apple Cider Sangria – Apple cider, prosecco, amaretto, and ginger ale combine to make this delicious sangria. A perfect cocktail for the fall! Before we get start today, I just want to dedicate this post to my loving husband. It’s out first anniversary today! This past year with him has shown me exactly why I married him; his kindness, his compassion, and his patience. We’ve been through tons of changes (new house, new job, this blog) and he’s handled them with such grace. He is the sweetest man I know and I am the luckiest woman in the world to have him. Happy Anniversary to us! Alright now for the celebratory booze! Cold weather where are you?! It’s mid-October and I wanna start wearing my boots! And scarfs! And flannel! I guess I should embrace the warm weather while I can. Come January, I will be begging for its return. #Southernerproblems. Since it’s still in the 70s here in Georgia, I feel odd making hot apple cider. But I want to enjoy the flavors of fall! So I decided to make a refreshing sangria instead. A sparkling apple cider sangria, to be exact. Woah, guys. This sangria was so refreshing and full of apple yumminess. And I love the color of the red and green apples. The amaretto and ginger ale pair perfectly with the cider to give it a well-balanced, crisp taste. I may or may not had 3 glasses in less than an hour. Whoops! Did I mention it was the perfect accompaniment to a Saturday of college football? Sometimes you just need something else besides beer. As an avid beer-drinker, I can’t believe I just said that. But I was a sangria-drinker first (I’ve been known to drink a whole carafe of sangria on my own), so beer will just have to understand. Sangria is so super easy to make. Just throw all the ingredients in a pitcher, stir, and serve! And this recipe is no exception. The only reason it could take 10 minutes to make is because you have to chop the apples. If you’re a fast chopper, it probably only takes 5 minutes. I use ginger ale to make this sangria extra bubbly. Plus, ginger pairs perfectly with apples. But if you don’t like ginger ale, you can use Sprite instead. Or even club soda. The amaretto adds so much depth to this drink. But feel free to try another liquor that you like. Cognac, triple sec, heck, even bourbon, if you want a stronger sangria. Sangria is a fun drink to experiment with. No combo is off-limits. I used red delicious apples and granny smith apples in this sangria. But you can honestly use any apple that you like. I just prefer the colors of those two together. And you can also slice instead of dicing it, if you want. Alrighty. Now you have everything you need to make this delicious, refreshing fall drink. What are you waiting for?! You should be making this right now! Unless you’re at work. Then maybe you wait until dinnertime. I hope you love it as much as I do! Check out the full recipe below. Apple cider, prosecco, amaretto, and ginger ale come together is this perfect cocktail for fall! Core apples and dice them into even chunks. Place into pitcher. Open champagne or prosecco and pour entire bottle into pitcher with apples. Add cider, ginger ale, and amaretto. Stir with a large wooden spoon. Let it sit in the fridge until chilled through, about 2 hours. But if you don't mind it at room temperature, go ahead and serve immediately. It tastes great either way! Scoop a spoon-full of diced apples into each glass. Pour sangria into each glass. Serve with a cinnamon stick. And I’ve actually been looking for a sangria recipe– this sounds delicious! Perfect for fall. What a great twist on sangria. It’s a little too cold here for this at the moment, but I will be bookmarking it for later! Congratulations on your Anniversary! These Sangria look delightful!! Your photos are gorgeous too! Colourful, tasty and it looks simply refreshing too. This looks pretty and sounds pretty good. I’ve never had amaretto before- isn’t it sort of almond-y? Yup! I was a little surprised too but it pairs so well! It brings out the crisp flavor of the cider. So amazing! I love apple cider and I love sangria. My two favorite things!! Gotta try it this week! Ooooh that looks amazing! I’ve gotta try it soon. My mouth is seriously salivating right now. That looks DELICIOUS. I love apple EVERYTHING in the fall, so this is perfect. PERFECT. Thanks so much! I seriously drank too much of this. But I couldn’t control myself! Congrats on your first anniversary! Sangria is one of my favourite summer drinks so I love the idea of making a fall version to drink this time of year! Happy anniversary! This looks so tasty and perfect for fall! This looks really good; it makes me wish it’s the weekend again! This is definitely my kind of sangria!! Yes! Fall drinks and food are so fun to make so I don’t blame ya! Yummy will be pinning for the holiday’s! These turned out beautifully! Happy Anniversary! I’m an apple cider addict so I’d love to try this! I am making something similar to this for our Halloween party this weekend! It looks delicious! Beautiful wedding and sangria pictures! I LOVE sangria and this sounds especially yummy. Love apples!!! This sounds so tasty! perfect for some fall parties! I would have to make the non alcohol version, since we don’t drink, looks and sounds really good. Thank you! You could definitely make this without alcohol. Just use Sprite instead of prosecco. Or even club soda! This looks amazing!! 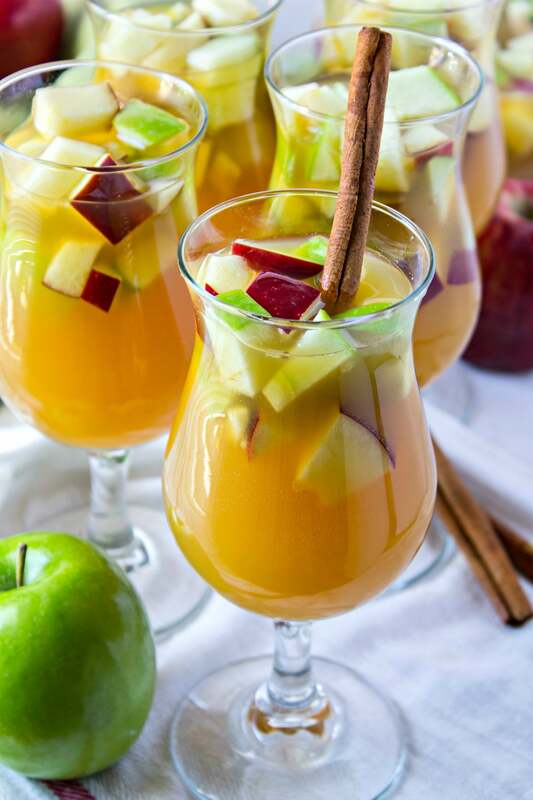 It’s hot here right now still in San Diego so I’ll have to try making this apple cider sangria this weekend! Happy anniversary by the way!! I hope you did something fun to celebrate 🙂 thanks for the great drink idea!